Moscow March is traditionally a cold and bleak month hated by many, but inside the Gubkin Cultural Centre, where Indian Holi Mela celebration took place, the frenzy of colours is almost blinding. March in Russia doesn’t resemble March in India in any form or shape. In India this is the time when spring claims its rights and people are in festive mood welcoming it. Moscow March is traditionally a cold and bleak month hated by many people and, in my opinion, rightly so. Moscow seems to be painted in all possible shades of gray. Dirty gray snow, heavy gray sky, even the clothes people are wearing are mostly black and gray. But inside the Gubkin Cultural Centre, where Indian Holi Mela celebration took place March, 20, the frenzy of colours is almost blinding. There were more than 3000 people. Women were dressed in red, yellow, orange and pink saris or dresses looking like beautiful exotic birds. Most of the people have their faces painted with special paint of all colours. People meeting each other in the hall stretch out the palms of their hands offering to share coloured powder and more – joyful Holi spirit. This time Holi celebration was even more special because of the 5th anniversary of the Indian dance contest. There were 10 collectives from different Russian cities including Moscow, Tver, Voronezh, Perm etc. The jury consisted of high-profile Russian sports, culture and art personalities such as Vladimir Kulyak, Andrey Smetanin, Natalya Goncharova and others. Guests of honour were politician Alexander Pochinok, artist Nikas Safronov, TV presenter Nikolay Drozdov and Dmitry Kiselev, Deputy Director of VGTRK. As Sammy Kotwani from The Imperial Tailoring co, one of the organizers of the event, says, “Dancers’ professionalism was amazing. They honed their performances to perfection”. “And also, he was quite impressed as a designer. “They put so much care in choosing their clothing. Every accessory matched perfectly well and completed their look”. The performers demonstrated a wide range of dances, from classical Indian dance to modern Bollywood dance, with such self-abandon, skill and attention to detail that they created a truly Indian ambience, which was all the more surprising considering that the overwhelming majority of the dancers were Russians. Besides dancing performances, there was a special nomination called “Old is Gold” in which participants were to present a scene from one of the classical Indian films of 1970-s – 1980-s as well as the Holi Song Contest. The audience was very supportive; the viewers greeted the dancers enthusiastically and burst into applause after each performance. Looking at the dancers, so confident and performing with such natural grace, it was hard to imagine them ever doubting their abilities. But Mr. Kotwani remarks: “You haven’t been behind the stage and haven’t seen those girls cry. There were black traces from their make-up and they looked so sad because they took their mistakes very seriously. But the eyes of those who did well were shining with happiness”. It’s worth mentioning that besides a great number of Indians there are more Russians celebrating Holi every year. 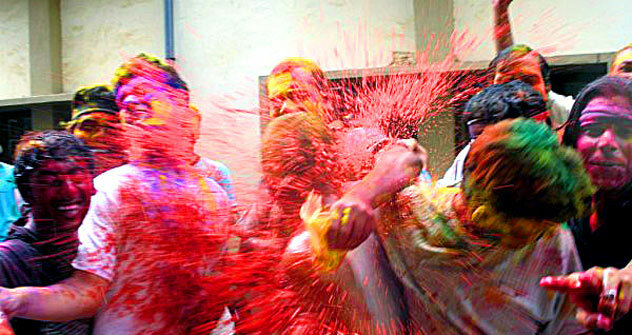 Dmitry Kiselev gives his reasons for Holi’s popularity in Russia. “For me Holi is a bright emotional event. Today in our country we witness a strange phenomenon: people begin to conceal their emotions, they lost the capacity to express their feelings beautifully and don’t pay much attention to their own culture”, he explains. “And Indians love and value their culture, and it’s contagious”. When asked what Russians and Indians have in common that makes an Indian holiday an important event in cultural life of Moscow, Dmitry replies that “there is intensity and depth of emotions in both Russian and Indian cultures that draws them to each other”. A well-known artist Nikas Safronov and his relative eminent TV presenter Nikolay Drozdov also share their reasons for coming to Holi. Nikas Safronov says that Indian culture has had a significant influence on his life and creative work. “During Holi celebration one can hear music, the sound of divine voices in one’s soul”, Nikas says pensively. “What’s amazing about Indian philosophers is that they managed to become children art the same time remaining grown-ups”. Nikolay adds with a smile: “Holi is the festival of beauty, peace and serenity”.